I’m delighted (and very surprised) to announce that the sixth Murder Most Unladylike Mystery, A Spoonful of Murder, has won the Berkshire Book Award 2019! 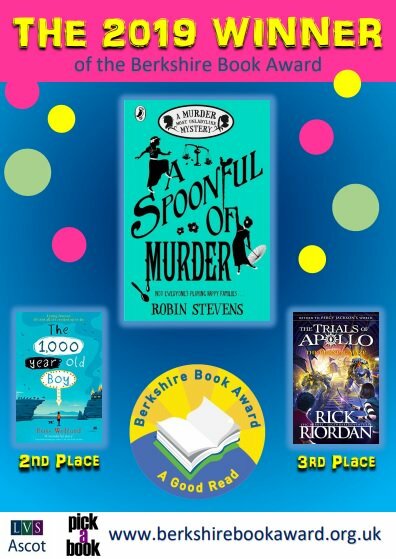 It’s wonderful that Berkshire young readers enjoyed my book so much – a huge thank you to everyone who voted for this award, and to the librarians who organised it. Congratulations to my fellow shortlistees, and especially to Ross and Rick – it was such a strong shortlist, and I’m a fan of every one of the authors on it. I hope you’ll take this opportunity to read all of the books on the 2019 list, because they’re all brilliant! Any one of them would have been a deserving winner. Well done robin!! You really deserve it! Hi Robin! Congratulations! You and ‘A Spoonful of Murder’ deserve it!